Microphones is a delicate questions, they are a pressure transducer and realize the passage of the sounds from air pressure to electric signal. Ok, this is a early assumption of the tecnologies about microphones(*) but what we want from them? …and with a beautiful design (why not?). I didn’t include cheapness because the quality is not cheap (in any field). Searching for the best audio recording I work with a different brands of microphones, models and tipologies in relation to the kind of instruments and sound I’m looking for. 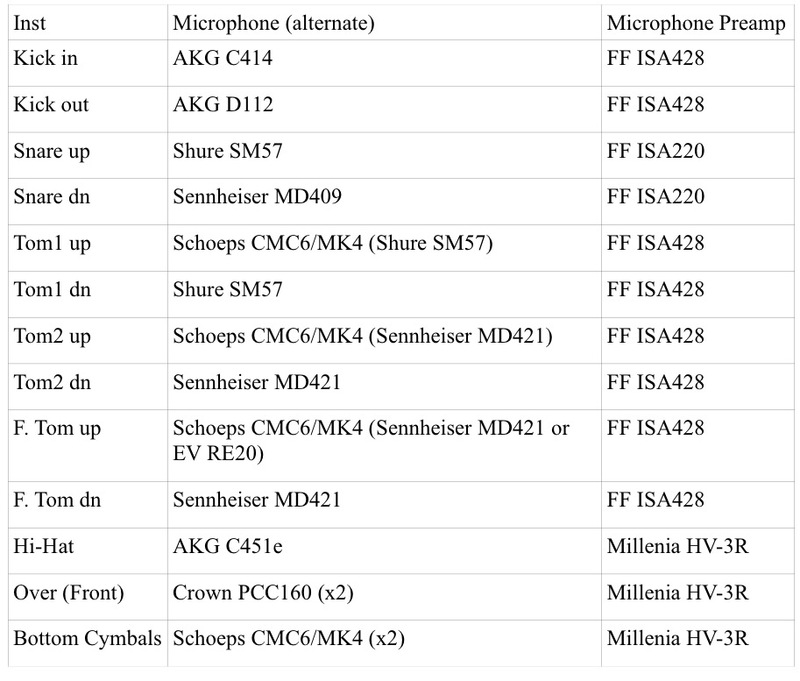 I use Schoeps to record many situations like choral ensemble, symphony orchestra, any acoustic instruments (guitar, strings, harp, double bass), several parts of drumset (toms, cymbals, hi-hat). Here an example of studio recording what I made with close-miking techniques. Schoeps MK4 + MK8 are perfect to made Mid-Side techniques, sometimes I use MK21 in lieu of MK4 to take a central’s large-scale section. Here an example of live recording what I made with Mid-Side techniques with Schoeps. Also MK21 is a very interesting solution to capture mainly low frequency in close miking. I bought two MK5 (matched pair) to obtain major flexibility and to try spaced techniques. I use them omnidirectional in close-miking to record percussions like djembe or bongo. I worked many times with Schoeps on stage to amplifier acoustic ensemble (classic and jazz) without problems. I like Schoeps, they are a finest microphones with amazing and useful sound reliable for any situation. They are my high quality set. I bought two used U87ai, they work very well. I use them to record vocal (typical) and sometimes with Shoeps to make mono coloured low-end. Here two examples of acoustic guitar recordings what I made Secondamarea and Manuel Consigli. I own only old microphones models: C414 B-ULS, C414 TL-II, C451E and C391 (C300 + CK91) . I bought two C414 XLS (first series) but I don’t liked them because their sound were knock-off and lifeless. C414 B-ULS is very flexible microphone, it works fine with acoustic instrument (acoustic guitar) and percussions. 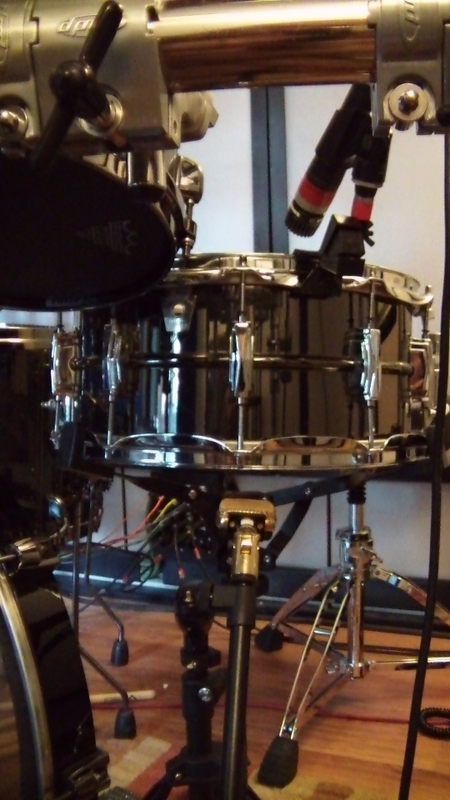 I used for many time C414 B-ULS for snare bottom and lately I use it very close to kick drumhead. C414 TL-II is a transformer-less version of C414 B-ULS, with a slightly mid-high frequency presence. I own a stereo matched set and I use often them to record choral ensemble, symphony orchestra (here an example of record what I made with C414 TL-II Mid-Side array), acoustic piano and acoustic guitar. I have been lucky to find a C451E, original version, because it sounds amazing, Shoeps like, with an amazing off-axys rejection. 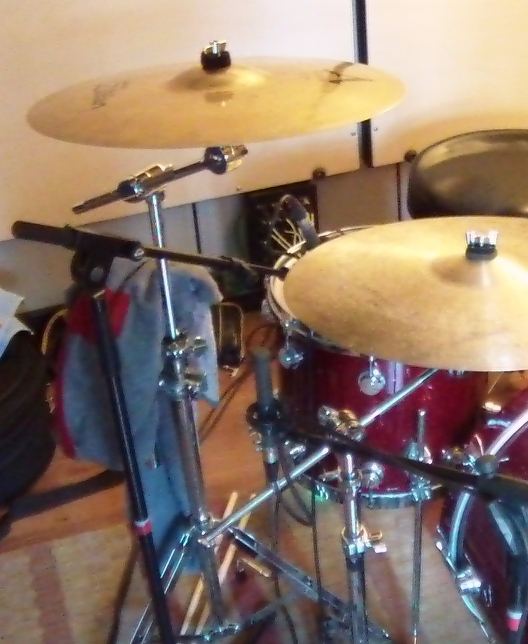 In studio I use it to capture hi-hat and in live recording it’s a nine microphone of my high quality set. C391 is a good microphone with a good price. It’s not a cheapness choice. It’s useful on-stage and good alternative in live recording. I bought two PCC-160, a boundary microphone, to capture speech on theatre. Three years ago I tried to use them for drums overhead (what? But they are a floor microphones!). Wait, I fixed them tip over on ceiling in front of drumset in stereo spaced array. I was very impressed for very wide and smooth sound without wall reflections problems. RE-20 is a cardioid fine broadcast microphone, very good for voice. It’s construction minimize proximity effect and place in-face vocal record. You can see and listen his neodynium-equipped brother RE27N/D in “A Prairie Home Companion” movie. I used it on voice for special effect, like speech into songs, to make a superior warmth and presence. I used it sometimes to record bass drum and I tried it to record guitar amplifier. I own three old MD 421, two black and one white (with tuckel). I use them to percussion and brass. Very good and warmth sound. I like it. I found three years ago one MD409 (dates back to the 1975). Actually I use it on snare bottom and to record guitar amplifier. D112 is a successor of D12 (very acclaimed microphone for vocal in the seventies). D112 is manufactured to use with instruments with a depth low end like bass amplifier or bass drums. 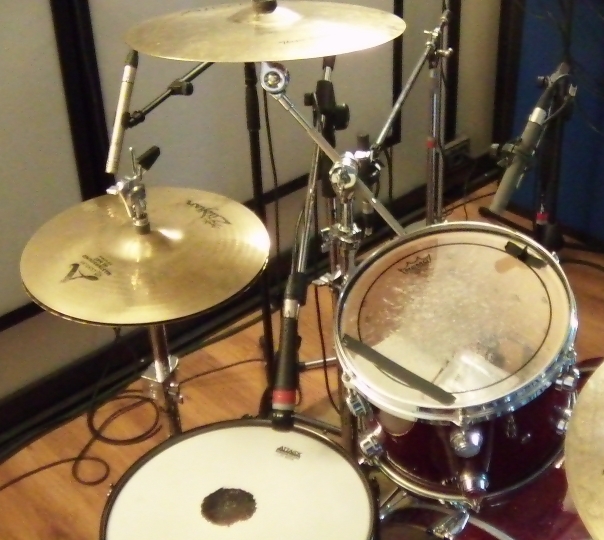 I use it to record bass drum in out position with AKG C414 B-ULS positioned very close to the kick drumhead. DX98, I bought this microphone many years ago and it’s perfect to amplifier tenor and baritone saxophone. A77, it dates back to the fifties and it’s a broadcast microphone. I used it on stage with a singer to enhance his nasal voice, very cool. A ribbon oldest microphone (dates back to the thirties) which I bought in 1998. I fixed it and occasionally I use it to record voice with oldest flavour. I tried JRS-34 model for a newspaper and I like it, but I haven’t unfortunatly. I guess probably I’ll be buying it pretty soon because I’ve been very impressed by its vocal presence and smoothed sound. Today I started a little column where I brought into focus technicals stuff. I’ll write short review about equipment in my studio and some tracking techniques that I use and why. I’ll post this column once a week (probabily sunday). 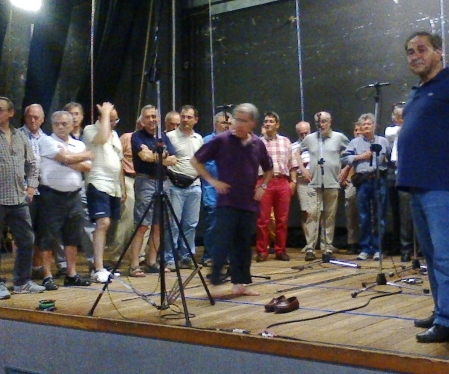 It’s a stereo tracking technique by Alain Blumlein based on a coincident array of two microphone, one directional (typical cardioid) in front of the audio source (orchestral ensemble or musical instrument) and one bidirectional (or eight figure) turned by 90 degrees. DPA microphone about polar patterns. Signals by Mid (cardioid) and Side (eight figure) using a matrix to achieve Left (M+S) and Right (M-S) channels (stereo signal). It’s possible switch any stereo signal into a Mid-Side couple with another matrix where Left/Right are summed into Mid (L+R) and subtract into Side (L-R). This is a fine technique used, for example, in mixing and mastering to adjust center component like vocal or electric bass (you have to think on a stereo signal builded with three components: Left/Center/Right) and to broadcast stereo signal on FM modulation, where Mid (L+R) is a mono signal and Side (L-R) is component to rebuild the original L/R signal. I like this technique for his nice and wide stereo front, mono compatibility (when stereo signal is collapsed Side dissapear) and fundamental possibility to encoding comeback (to rebuild original Mid-Side signals). It’s important to highlight the front position of the cardioid microphone (Mid) because it’s the best way to shot center audio source. Unlike ORTF and XY where the microphones are angled and the recording may be less accurate for the off-axys coloration. Since 1997 I realized M-S technique with several microphone: Rode NT-2 (cardioid) coupled with AKG C414 ULS (eight figure), with two matched AKG C414 TL-II and actually with a Shoeps CMC6/MK4 (cardioid) or MK21 (wide cardioid) to Mid and Shoeps CMC6/MK8 to Side. Most of my recordings of strings ensemble or choir were made with this technique, sometimes I added close microphones (multimicrophones technique) to capture several instruments. Developed by French public television, it’s composed by two matched pair microphones spaced at 17cm each other and angled by 55 degrees. It’s a near coincident technique. DPA microphone about ORTF tecnique. Less wide than M-S tecnique I like it to record stereo close miking (like acoustic guitar), small vocal ensemble and, generally, when I need to minimize environmental reverberation. It’s not monocompatible but it still works well. Also this technic has been developed by Alain Blumlein, he used a cardioid (originally eight figure) matched pair microphones angled 90 degrees each other with coincident capsule. It’s a coincident technique. DPA microphone about XY technique. With a stereo front narrow, XY is the solution for small audio source (like a musical instrument) where it’s important monocompatibility, to attenuate a problematic environmental reverberation and to realize a simple stereo technique. In this gallery I arrange microphones in ORTF and XY techniques.